Aqua, Alcohol, Ammonium Lauryl Sulfate, Cocamidopropyl Betaine, Cocoamide Dea, Propylene Glycol, Polysorbate 20, Salix Alba (Willow) Bark Extract, Disodium Edta, Diazolidinyl Urea, Iodopropynyl Butylcarbamate, Anthemis Nobilis Flower Extract, Citrus Aurantifolia Swingle Oil. Formulated with natural ingredients, the BeautySoClean Conditioning Brush Cleanser is a super-efficient yet gentle makeup brush cleanser that quickly dissolves all makeup residue while leaving your brushes fresh, clean and soft. The perfect blend of alcohol and emollients ensures your brushes will feel soft and dries within seconds. 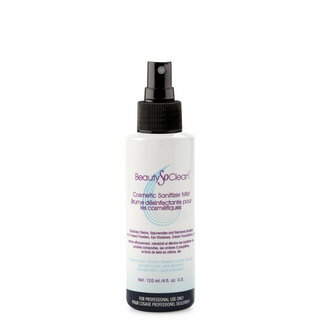 Conditioning brush cleanser is formulated with natural ingredients and is non-irritating. Swipe and go method, spray brush and remove cosmetic residue with paper towel. Repeat if necessary. I used this on an ongoing makeup job where we were working on a lot of people and had to quickly clean and sanitize our brushes in between clients. We were using Japanese hand crafted brushes in addition to Charlotte Tilburys brushes and this worked on both. It's made with food grade alcohol so it won't strip brushes but still sanitizes them. If you are using Wayne Goss of Chikuhodo brushes then you need to clean them as gently as possibly since they are made from goat and squirrel and you want to them to retain their softness. I found that it worked best when you sprayed it into a paper towel and wiped the brushes down that way. For spot cleaning a foundation brush you will need more product and I suggest spraying it directly on the brush hair, taking care not to overly saturate it. Great tools are an investment and like any investment you want to take care of it. While I don't recommend putting your brushes in a glass vault, never to be touched; some extra care and thought is needed. You want your brushes to last you a lifetime but you also want to keep them clean and sanitized which is hard when the recommended time in between washing is 1-2 months. That's where BeautySoClean comes in. While a microfiber cloth can work in most cases to remove unwanted color from the brush, you might a) have an oily skin type to where bacteria building on your brushes is a concern b) you use many cream liquid or gel products or c) you are a mua so sanitation is important. 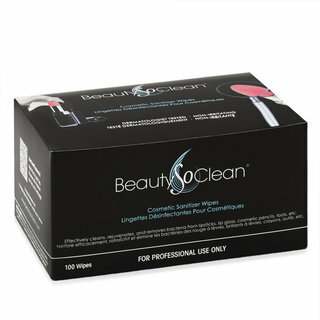 In all cases, BeautySoClean can rid your brushes of excess color and keep them sanitary without drying the delicate hairs out since it is a food grade alcohol. Definitely do a baby shampoo bath every 1-2 months but keep this on hand for those in-between needs! I got this in my Lucky Bag, and I can't say I'm thrilled with it. I've tried it on a few different brushes--foundation, blush, eyeshadow--and it hasn't cleaned anything effectively. I had to spray and wipe my MAC 239 four times to get the majority of the eyeshadow out (it wasn't even a really dark shade! ), and even then there was residue. It even took a few spritzes to get my fluffier crease brush nearly clean; again, it never got 100% clean. Forget about using it on a foundation brush--your arm will get tired before it gets clean. I'd say if you're looking for something to just spot clean brushes you apply powder products with, and you only use lighter colored eyeshadows and blushes, you might like this. If you're looking for something to clean your brushes entirely, or spot clean your foundation brush between uses, look elsewhere. This was recommended by Beautylish to clean my Wayne Goss brushes for spot cleaning. It's very nice. I only wash his brushes once a month and I use the other tub soap cleaner for that, they also recommended that one, can't remember the name. This is my second bottle. It cleans your brushes quickly and it dries quickly. A great way to keep brushes conditioned and cleaned in between the 1-2 months brush bath. I like the sanitation benefit as well. Wow, thank goodness Beautylish is on it!! I have never owned any type of high end brush set, although I have become really good with my makeup, I normally use drugstore brushes, Morphe, Real Techniques, the highest end would be IT Cosmetics, so I really wanted to treat myself to the Wayne Goss eye set, and omg I am in love with them, but my next question was.....do I need to care for these differently? A few days after my brushes arrived, Beautylish sent me an email on how to care for real hair brushes, and thank goodness too, I though washing my eye brushes every single day in baby shampoo was taking good care of them, WRONG!!! Now I know I would have broken down and ruined these, so I literally did not do any washing at all (again) on them until I came back here and ordered all 3 products recommended for their care, and so glad I did, this was one of the products and I am so happy!!!! I was looking for something to use to give my brushes a quick clean after use so they would be ready for the next day. This is great, it cleans the brushes quickly, thoroughly and they dry super quick. The leave the brushes nicely conditioned as well, especially my goss and sonia brushes. I usually deep clean my brushes at least every 2 weeks and this has really been a big help in between those times.